Join Patina Catering (famous restaurants include Patina, Eat. 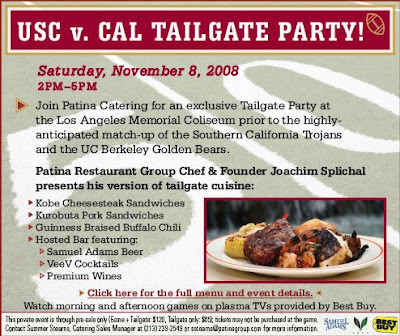 on Sunset, Cafe Pinot) at their exclusive USC vs CAL Tailgate Party outside the L.A. Coliseum, this Saturday, November 8th from 2pm-5pm. Hosted Open Bar and beverages featuring sponsors, Veev Acai Spirit and Samuel Adams Beer. Click the title link for map location, menu (yippie for Kobe beef! ), and game tickets and tailgate party packages. Yummy! Love kobe...beef, not Bryant.